Hello 2013. Hello Melbourne. 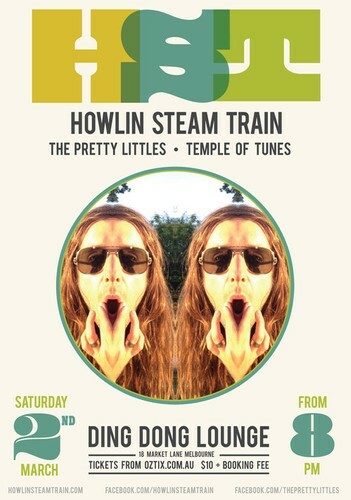 It's Howlin' Steam Train. We've spent the summer writing, recording a new EP (soon to be released) and festivaling (Queenscliff, Falls Festival, and some more). We are keen to give you a taste of the fruits of our summer wears. Yes, a taste of the fruity spritzy water from the cooler in which the crowds gather around and talk about the refreshing, exciting... Howlin' Steam Train. Also. The Pretty Littles with their pretty little fiddles (guitars and drums and bass and stuff, no fiddles) are a bunch of dudes who like playing music. And what better way to open the night then with Yan's (HST) Dad's band, Temple of Tunes. A brilliant 3 piece and a support that's been 25 years in the making.